The Niagara Peninsula is a world-famous wine growing region encompassing 125 wineries that produce a wide range of high-quality wine varieties including Pinot Noir, Merlot, Cabernet Sauvignon, Chardonnay, Riesling, Icewine, Pinot Gris, Sauvignon Blanc, and more. This now-thriving wine region was first established in the 1950s and saw rapid growth beginning in the 1970s, continuing into today. The region has an ideal grape-growing climate that is directly influenced and affected by Lake Ontario and the Niagara Escarpment, featuring both warm and cool temperatures that are optimal for growing flavourful grapes. The Niagara Region also has the distinction of being one of the few regions in the world able to produce Ice wine, which is a sweet dessert wine produced in winter from grapes that have been frozen while still on the vine. The Sheraton on the Falls will help connect you with some of the region’s best winery experiences with its Ultimate Winery Experience Package, which takes the trouble out of planning the perfect winery tour weekend. 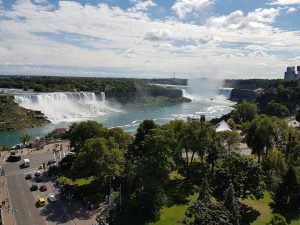 The package includes one night hotel accommodation at the Sheraton on the Falls hotel, winery tour and tastings for two at four amazing wineries including transportation, three Fallsview dining gift cards, and credit at the beautiful Christienne Fallsview Spa. Another easy and convenient way to experience the Niagara Wine Region is with Magnificent Tours’ Niagara Wine Tour. This 5-hour tour will take you to tastings at Jackson Triggs Winery, Reif Estate Winery, Inniskillin Wines, and a tour and tasting at Konzelmann Estate Winery. You won’t have to worry about transportation and can be picked up at the Sheraton on the Falls hotel, making your entire Niagara Falls experience relaxing and stress-free. Spring is a wonderful time to experience Niagara’s wine region and if you’re planning a visit during this upcoming season, don’t forget to also check out the Niagara Food & Wine Expo at the Scotiabank Convention Centre from April 21st-23rd, where you can taste both local and international wine and beer alongside delicious culinary delights from some of the region’s top chefs.